Going public about one's HIV status is seen as the right thing to do. It helps to fight the stigma and discrimination. Or so we are told. But when your mother tells the whole nation that she is positive, how do you come to terms with every child at school knowing this information? Both Farai Mahoso and Olivea Kusemwha grappled with this question when their mothers came out as HIV positive. Farai Mahaso is the son of the late Auxillia Chimusoro. Ms Chimusoro was the first person in Zimbabwe to openly disclose the fact that she was HIV positive. This was back in 1989 when silence around HIV and AIDS prevailed. For young Farai his mother's disclosure did not go down well with him in the beginning. "I suggested to her that she could just tell the world she had been bewitched and we could get on with our lives," he said. Ordinary activities like walking in the township in Masvingo became difficult for Farai. "It was like when a football star walks in town, everybody points their fingers saying that's the famous footballer. But for me it was the other way round." Farai was seen as the face of AIDS and people would shout out that he is the son of the woman who is HIV positive. 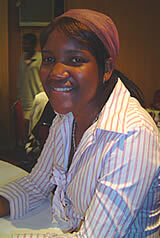 Zimbabwean HIV/AIDS activist Tendayi Westerhoff's daughter, Olivea, was equally frustrated by her mother's disclosure. Olivea said that she was very angry the first day her mum went public about her status. "Just imagine everyone knowing that your mum is HIV positive. I felt really uncomfortable with it," she said. Going to school for Olivea became hell on earth as her fellow students made cuttings from the newspaper about the comments her mother had been making about her status. She said people who she thought were her friends turned out to be back stabbers. But now Olivea says she is no longer bothered about her mums HIV status and some of her friends have come to understand that it can happen to anyone. This year Tendai Westerhof was honored with the Auxillia Chimusoro Award for her courage and openness, which has encouraged frank discussions on HIV and AIDS issues. The Auxillia Chimusoro Award honors the work of Farai's mother who died of AIDS after dedicating her life to raising awareness about HIV/AIDS. The Auxillia Chimusoro Award was established by USAID in 2000 and the annual ceremony is organised by the Zimbabwe Aids Policy and Advocacy Project (ZAPA). And today, Farai works in the HIV/AIDS sector as the Programme Officer for Batanai HIV/AIDS support group based in Masvingo, an organisation started by his late mother. Olivea and Farai are just two of the many people who have had to come to terms with the reality of HIV/AIDS. They say that they have been inspired by the work of their mothers. Going public about one's status is not an easy road, but for some letting the world know what is going on in their lives means that they might help save someone's life.